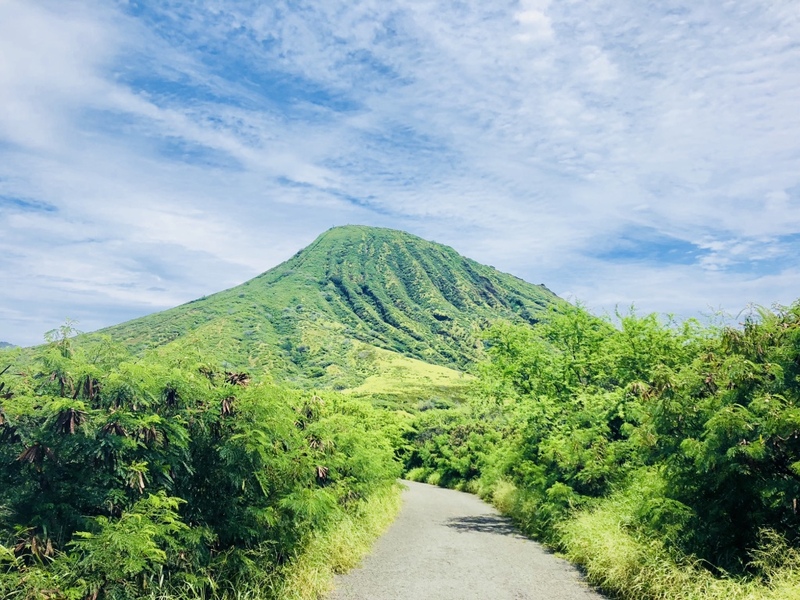 Any disappointment that Shane and I felt as we stepped out of the luxury cruise world and back into the grotty backpacker world quickly evaporated as we remembered that we were IN HAWAII. 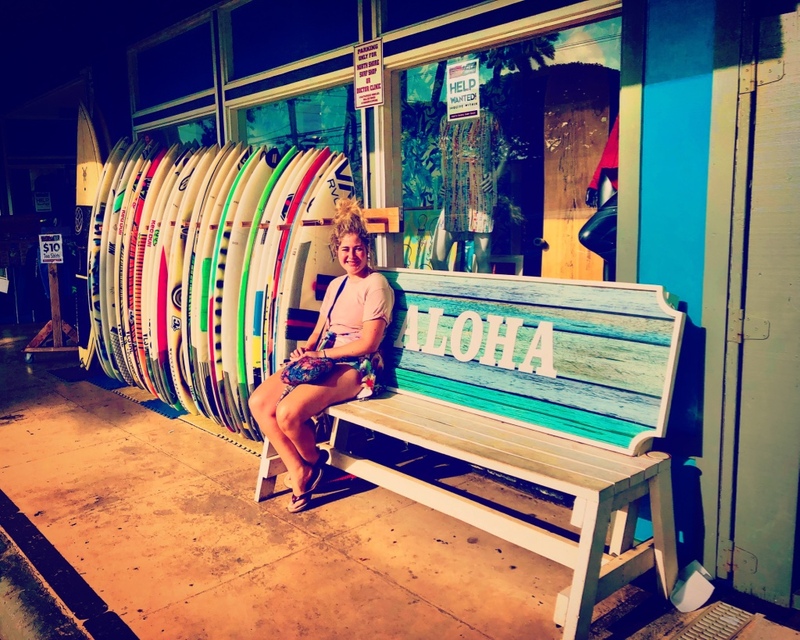 We spent our first few days on the famous Waikiki beach, a tourist hot spot and a hive of activity. The area was packed with resorts, shops, and surfers. It was busy and hectic, but after almost three weeks in the middle of the ocean, we were ready for the sights, sounds, and hubbub of Waikiki. Even with the overcrowded beach, numerous shopping malls and busy hotels, the area had a distinctly Hawaiian feel. Statues of old Hawaiian leaders dotted the streets, and were decorated with flowers, leis and shells. 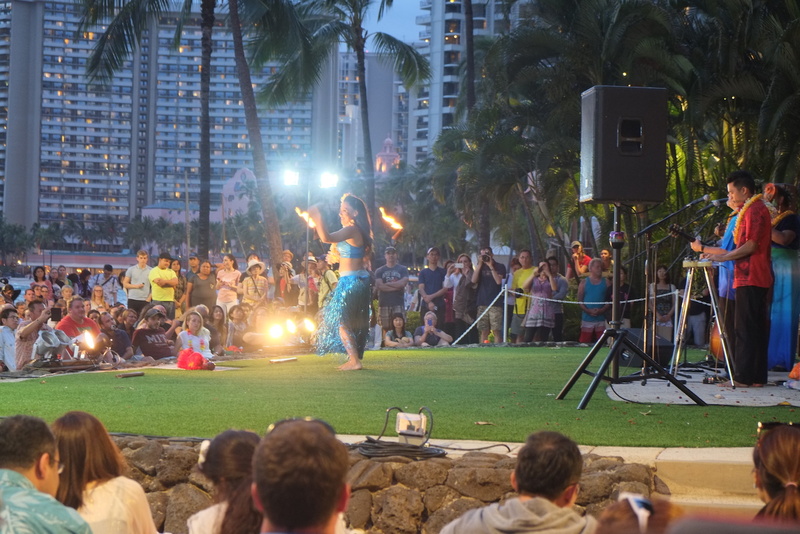 In the evenings, the beach was filled with people watching free Hawaiian music and hula shows. We caught dramatic views of the sunset every night. Waikiki was busy, but the town and its people still seemed to embody the Hawaiian concept of ‘Aloha’. Aloha means hello and goodbye, but it also means something more, which doesn’t have a complete English equivalent. It expresses love, a connection to nature, and a positive outlook on life. While we were very happy to be in Hawaii, our bank account was a little less than overjoyed. 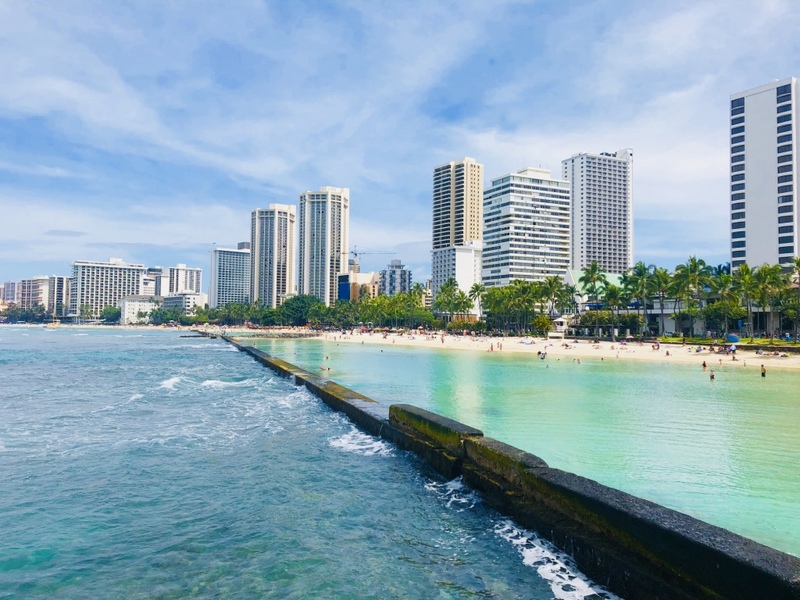 We quickly discovered that Hawaii is one of the most expensive holiday destinations in the world. It is thousands of miles away from any other population center, and thousands of miles away from the United States, where most of its goods come from. The cost of living is much more expensive than elsewhere in the country, and many local people struggle to make ends meet. 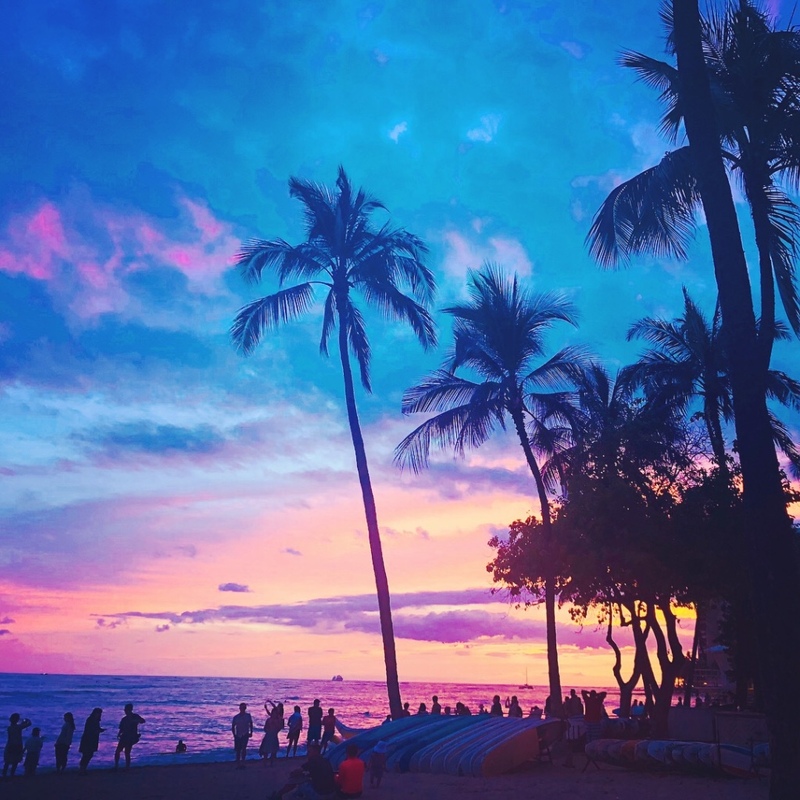 At the same time, hotels, shops and restaurants charge ridiculous prices, making Hawaii almost impossible to travel to on a budget. For Shane and I, it was a shock. Accommodation, food and transport in Australia had felt very expensive to us, but Hawaii was in a different league. We did our best to keep costs down. Despite staying in a dorm room with no air conditioning and a shared mouldy bathroom in the cheapest hostel we could find, the bill came in at $92 per night for two beds. We tried to make our own food, but a trip to the supermarket proved expensive, with a quarter-loaf of bread costing around $4. We wanted to rent a car, but parking in Waikiki was extortionate, so we became skilled users of the Oahu bus network. We made use of free snorkeling equipment at our hostel and the natural beauty of the island, and found as many free activities as possible. 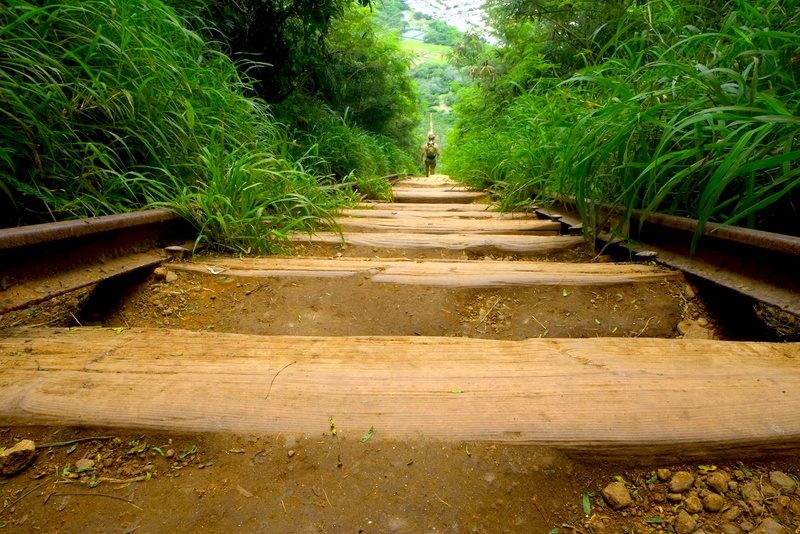 One day we hiked through the rainforest with some other backpackers from our hostel to see a remote waterfall. Another day we took the bus to Pearl Harbour and the Arizona Memorial. 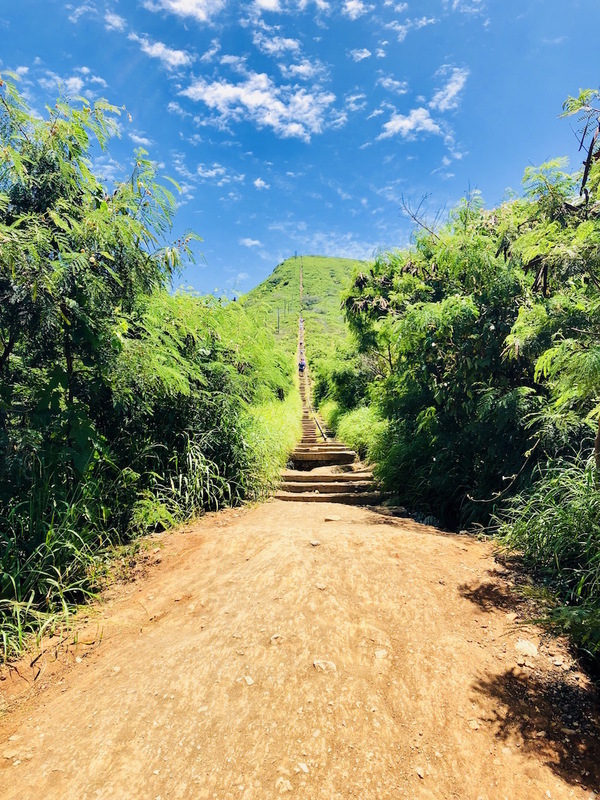 One morning we walked from our hostel to the start of the Diamond Head trail, which took us up into the crater of a volcano to explore what used to be a military base. 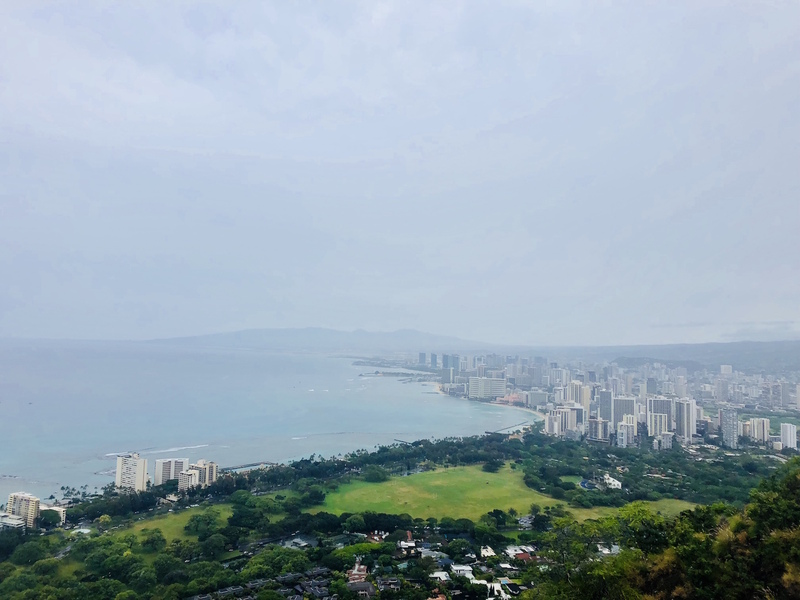 We had a great time clambering through tunnels, and from the top took in an epic view of Waikiki and the surrounding areas, all for a $1 entrance fee. 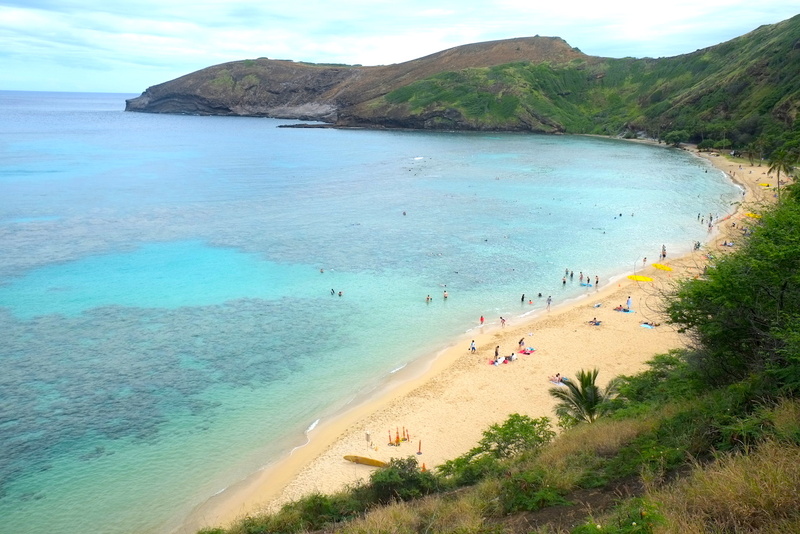 On another day, we took the bus to Hanauma Bay, a famous snorkeling site. 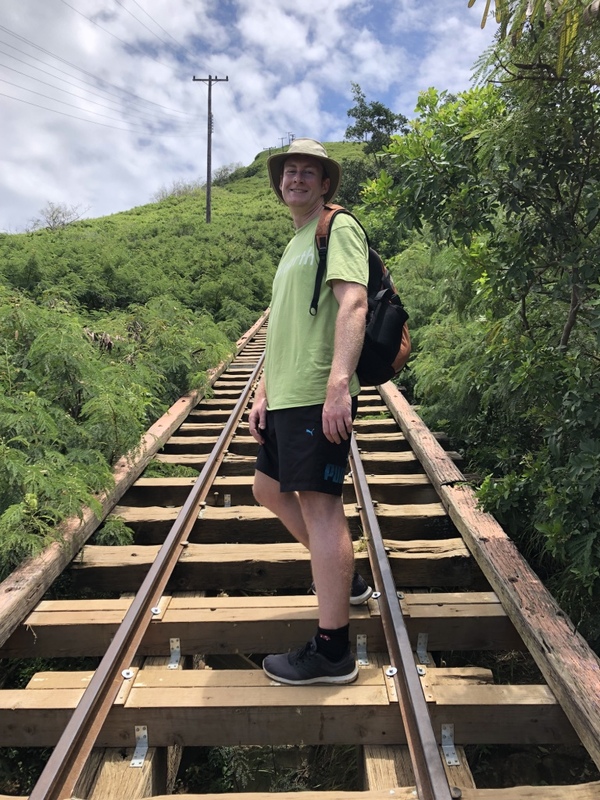 We spent the morning hiking up the steep and and completed the nearby challenging Koko Head trail, which involved climbing up a railway track and trying not to fall through the gap. 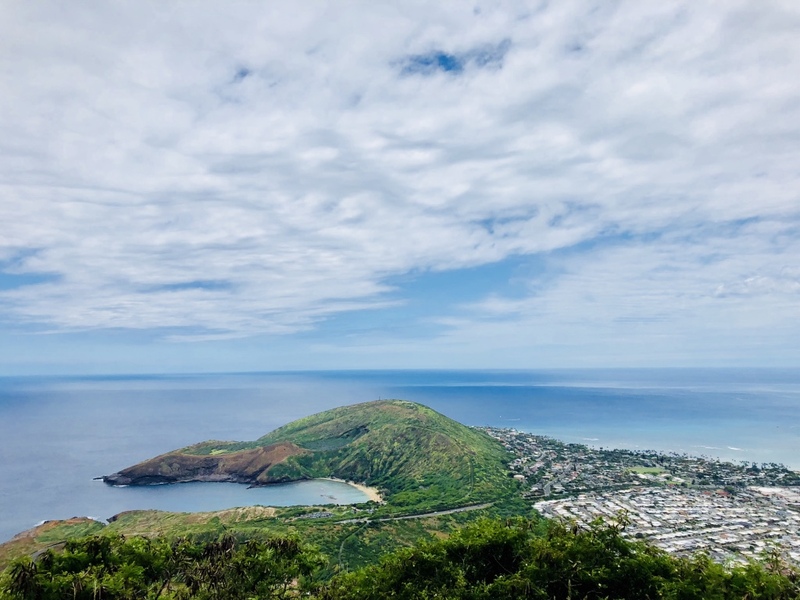 In the afternoon, we made use of the free snorkeling equipment from the hostel and spotted an array of colourful fish in the beautiful Hanauma Bay. 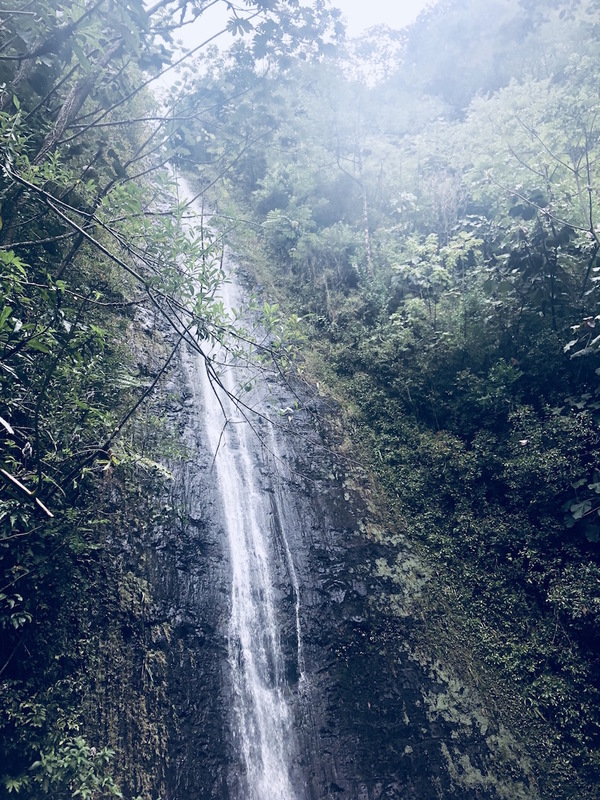 After a few days of hustle and bustle in Waikiki, we rented a car and headed up to the more isolated but more serene North Shore of Oahu. Once again we stayed in the cheapest accommodation we could find – this time a kind of plantation village, with old and dilapidated but generously sized wooden cabins, where we had our own slightly-falling-to-pieces room for a pricey $86 per night. 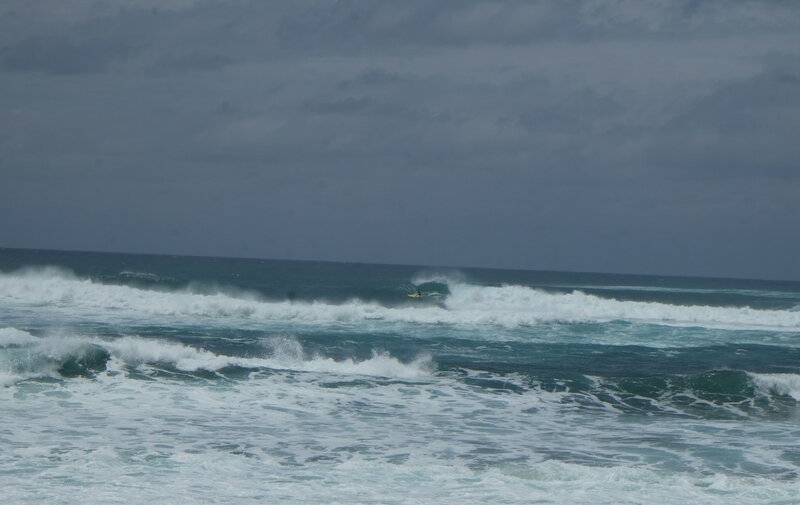 Once again, we did our best to keep costs down by cooking our own food, making use of the available free snorkeling equipment, wandering the beaches in search of giant green sea turtles, and watching some very brave people surf some very epic waves. 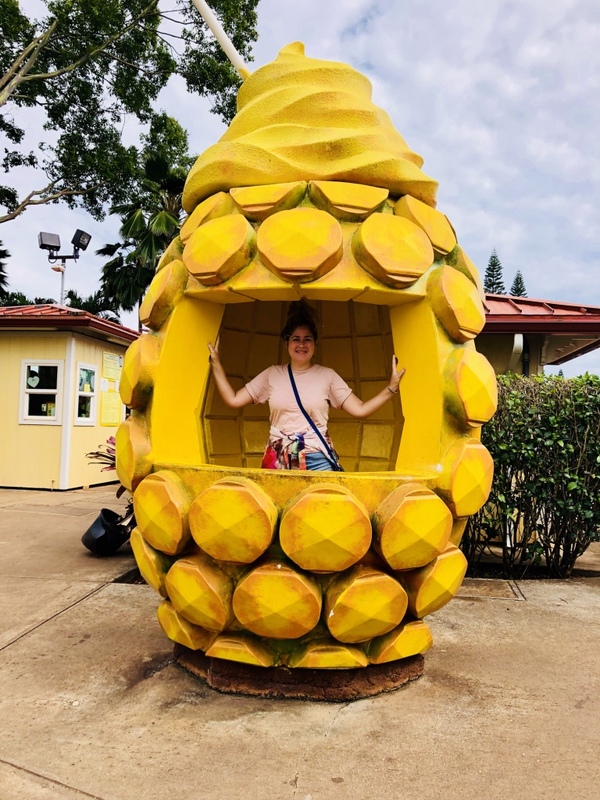 We also enjoyed a free visit to the dole plantation, where you can see pineapples growing and purchase various pineapple-themed souvenirs and snacks. 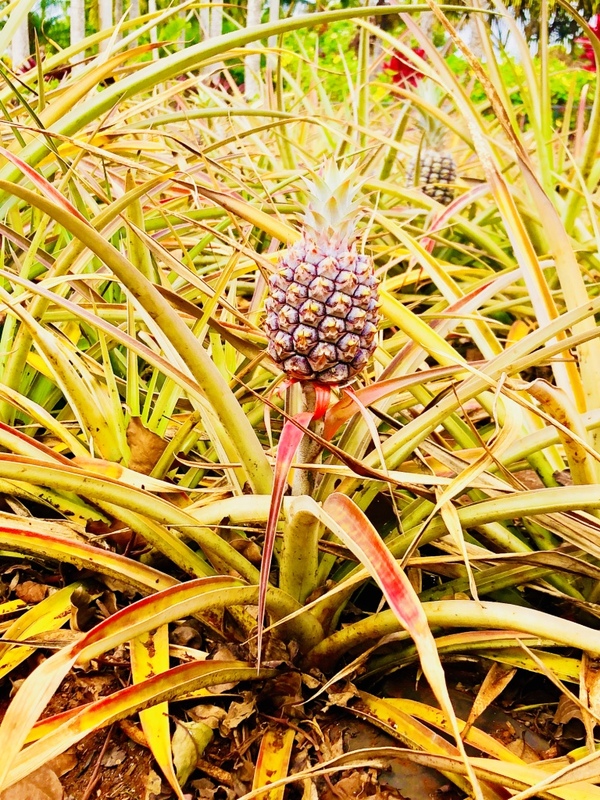 As part of our visit we had to try out the biggest maze in the world, which also happened to be shaped like a pineapple. This did incur a small fee but was worth it for an entertaining afternoon of pure pineapple joy. 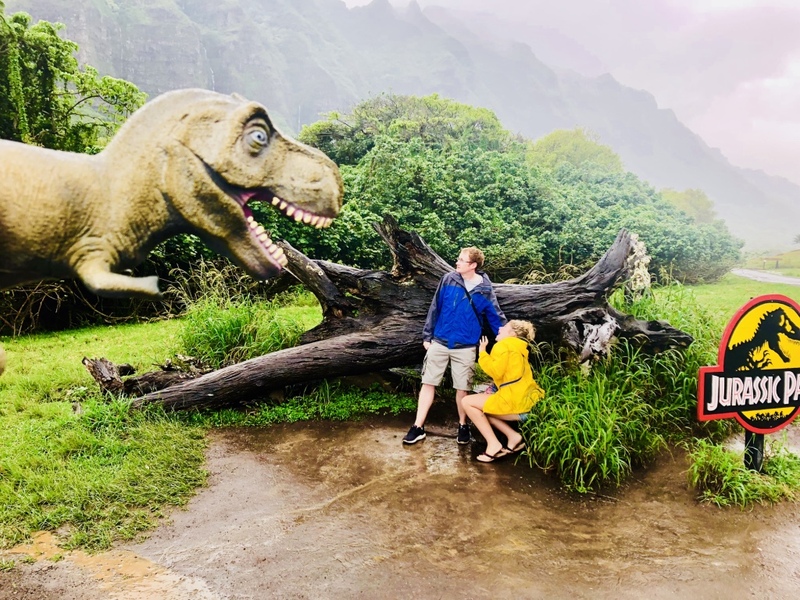 On one occasion we did make a mistake by spending $40 each on a ‘movie tour’ at Kualoa Ranch, a private nature reserve, cattle ranch and filming location, because we thought (or were misled by their marketing material into believing) that Jurassic Park was filmed there. 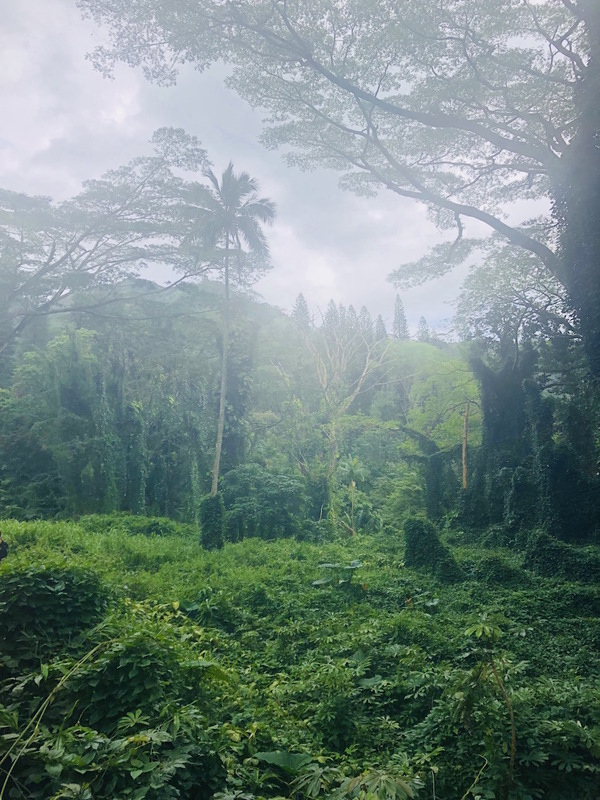 In fact, Jurassic Park was filmed on the island of Kauai, and just one scene (this one) was filmed at Kualoa Ranch on Oahu. While we had great fun recreating that scene, it was disappointing to realize that was it, and we regretted blowing our budget for what essentially amounted to a photo of us with a semi-famous tree. This experience aside, we enjoyed our peaceful, tranquil time on the North Shore. We found plenty of deserted beaches, fun food trucks (though our budget wouldn’t stretch to a food truck meal) and friendly people. The Aloha spirit was alive and well, and we felt rested, relaxed and ready to fly to Los Angeles. We touched down at LAX around 10pm, and met my parents at our hotel just outside the airport. 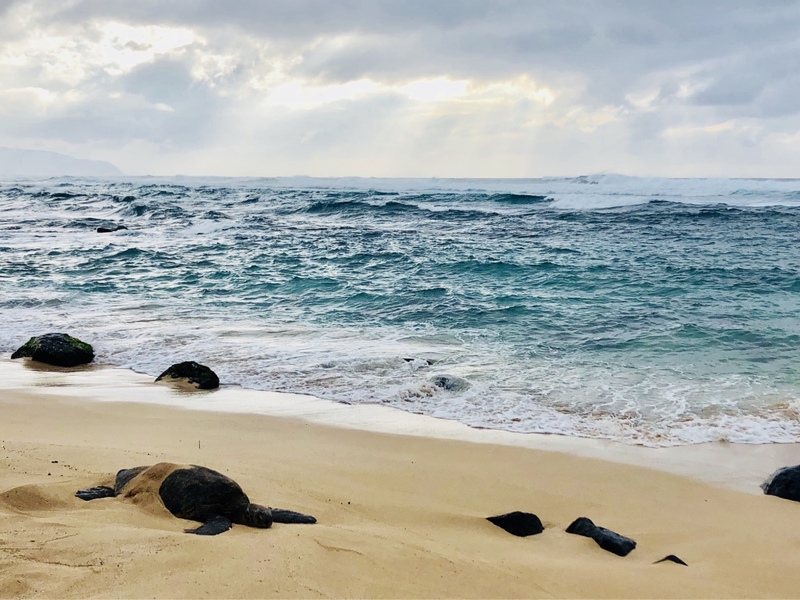 While we needed little recovery time from our short haul domestic flight from Hawaii, they had endured a long flight, a long wait to pass through immigration and some serious time changes. 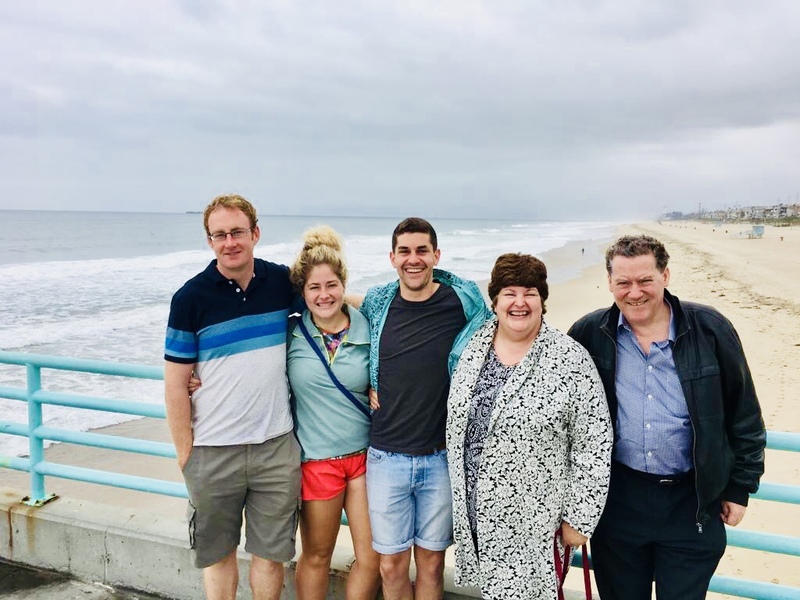 In the case of my brother, he’d had to fly from Birmingham to LA via Dublin and London Heathrow (yes, in that order), so he was feeling particularly weary. We spent our first couple of days chilling out near the beach and visiting a nearby shopping mall to replace as much of our well-used (falling apart) travel clothes as possible. We also visited some of our favourite eating establishments: Chili’s (a wonderful place with delicious honey chipotle chicken strips and a chocolate-volcano dessert), BJ’s (which makes the most delicious pizza ever, and a wonderful hot cookie with ice cream dessert) and Panda Express (a fast-food restaurant where the cuisine is loosely based on Chinese food, and you can find the extremely tasty orange chicken). 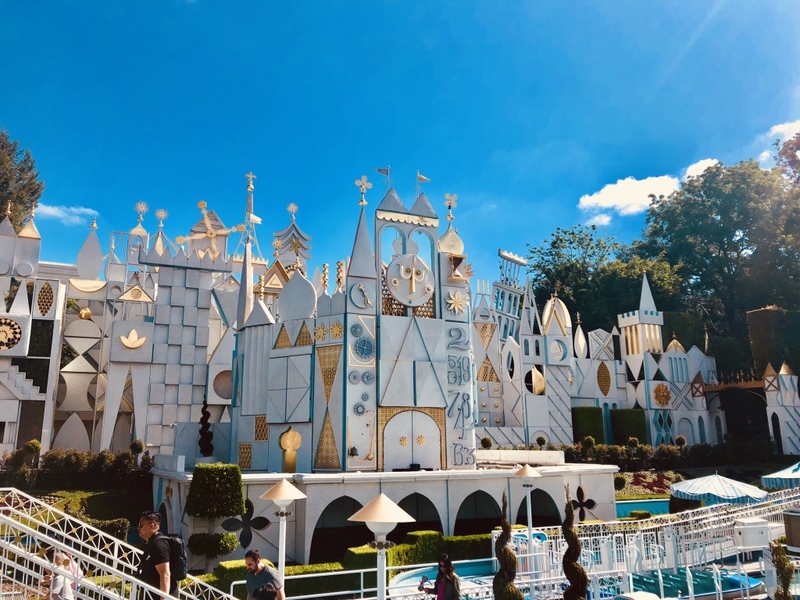 Having visited Tokyo Disneyland and Shanghai Disneyland in October last year, we were all very excited to return to the original and, in my opinion, the best Disneyland in the whole world, which can be found in Anaheim, California. 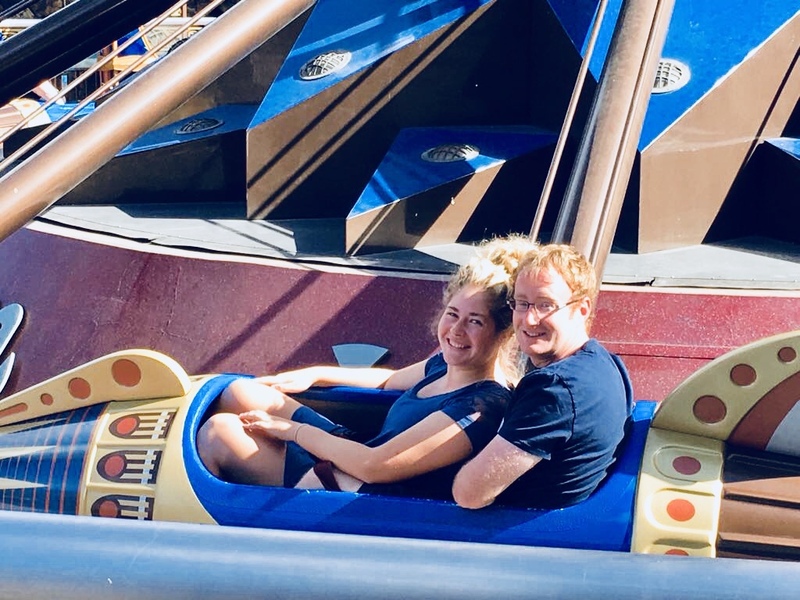 We had five whole days to enjoy the two theme parks (Disneyland and Disney’s California Adventure), as well as the facilities of Disney’s Grand Californian Hotel (Shane, Tom and I didn’t actually stay there but were able to use the pool and everything else – thanks Mum and Dad!). 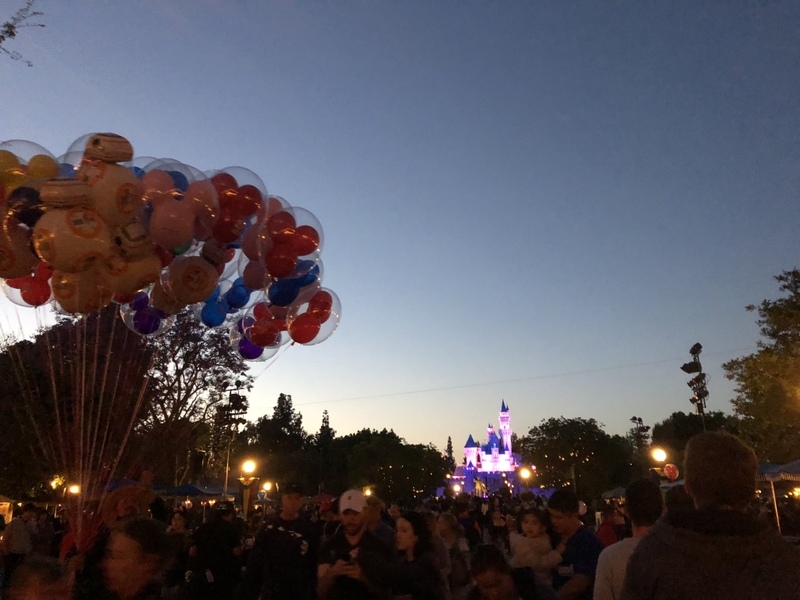 It was a busy five days, and involved early mornings to make the most of extra magic hours, as well as some late nights to watch the Pixar themed electrical parade and fireworks spectacular. Tom being Tom, he quickly made friends with some Disney employees, and somehow managed to keep a schedule that involved waking up at 6.00am to get ready for our day at Disney, and staying up until nearly 1.00am with his friends. We had a fantastic time at Disneyland, never ran out of fun things to do over our five days, and discovered new and exciting attractions, such as the Frozen show in Disney’s California Adventure – an hour long musical spectacular featuring all the great songs from Frozen and some hilarious facial expressions from Olaf the snowman. The last five weeks since we left Australia have been five of the best weeks of our trip around the world. 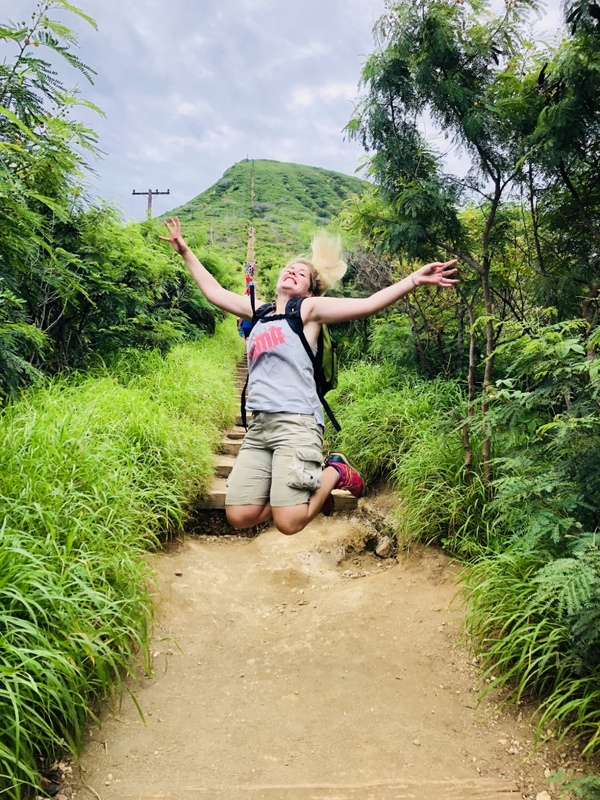 We’ve had an absolute blast cruising across the Pacific, visiting French Polynesia (especially Bora Bora), chilling out in Hawaii and conquering Disneyland with my family. We are sad to say goodbye to our peaceful, easy way of life, and very sad to say goodbye to my family once again, but hopefully our bank accounts and our adventurous spirit will thank us for exploring a new continent.